Humble necessity or heroic achievement…. 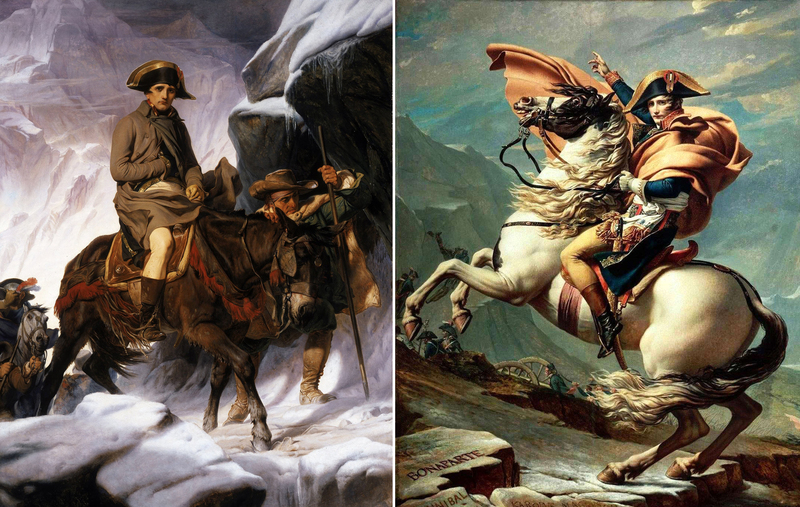 Bonaparte’s crossing of the Alps in the spring of 1800 has been portrayed as both but the pictures say more about the reasons for their commissioning than about the reality of the feat that led ultimately to the great French victory at Marengo. The heroic image was commissioned by Joseph Bonaparte to impress the king of Spain. Napoleon liked it so much he commissioned his own copy and in the end Jacques Louis David ended up creating five variations of the image. The more humble portrayal by Delaroche was commissioned by a collector of Napoleonic memorabilia in 1850. Whatever the reality of the crossing may have been, the feat was a logistical nightmare. Lucky for Napoleon that he had a logistical genius to manage the movements of his army. Whatever his limitations on the battlefield no one can deny the skill with which Alexandre Berthier, Bonaparte’s chief-of-staff, planned and executed a route of march. The episode is central to the opening chapters of my novel, Bitter Glory, so I thought I would post something about this dramatic offensive. Bonaparte’s masterminding of his army’s crossing was undoubtedly a strategic master stroke, falling upon the rear of the Austrian army that had its focus on the Var front towards Nice and the siege of Genoa on the coast. But the move wasn’t without risk. Snow was still thick on the main passes. The going was difficult for cavalry and close to impossible for artillery. The guns had to be dismantled and sledges improvised to move the heavy barrels. And when the vanguard under General Lannes reached the fortress at Bard, manned by a relative handful of Austrian troops, the plan almost fell apart completely. The fortress dominated the valley of the river Dora Baltea as it tumbled down towards the plain of Lombardy from the high Alps. Built on a sheer promontory at a sharp bend in the river its guns could sweep all approach paths. Provided the defenders had some backbone they could hope to stave off any attack that lacked full blown siege machinery, and Bard’s commander, Hauptmann Josef Otto Stockard von Bernkopf, a veteran of the Kinsky regiment, had that backbone. It was only the discovery of a shepherd’s path high up the valley side that allowed Lannes’ infantry to push ahead via a precarious detour. But push on he did. Lannes, Bonaparte’s best leader of vanguard troops, was aggressive and daring. He abandoned his artillery and forced on with whatever units could make it over the shepherd’s path. After five days, with actions at Chatillon, Bard and Ivrea, he was down the valley and into the fertile plain of Lombardy. The campaign had not stalled and history was ready to be made.